With the musical times passing him by and his recent albums showing little sales punch, Bryan Ferry and his aging image have the look of an endangered species. And when the singer tossed glitter into the air during his first song at the Pantages Theatre on Wednesday, it looked like a desperate, flailing attempt to recapture the past. Then Ferry proceeded to turn in a charming, involving concert, bringing a touch of playfulness to his wounded-romantic persona and summoning more conviction than you'd think possible. He didn't break character, he didn't break ground, but he put some heart into his mannered warble, and the performance of his nine musicians evinced respect for his music and for his audience. In fact, Ferry seemed to know that the band was the real spark of the show, and he allowed them full rein. The evening came palpably alive during Melvin Davis' awesomely physical bass solo, where it seemed very likely that he'd snap his instrument's neck with the fingers of his left hand. Ferry and company turned his music's split personality to their advantage. In the richly atmospheric mood pieces such as "Slave to Love" and "Swept Away," supremely sensuous swells of sound filled the party-tent stage set over the lapping funk beats. The rockers, ranging as far back as Roxy Music's "Virginia Plain" and "Do the Strand," didn't have any real grit, but grit isn't the currency in Ferry's dream-pop realm. Engaging artifice is his game, and he still plays like a master. "When I'm on the 4-string, I know what to do," says Melvin Davis with a smile. "It's the norm. But when I get my 7-string into my hands, it's almost spiritual. It's a huge vehicle with almost infinite possibilities, and I really enjoy accepting the challenge. Why stay on the sheltered shore when you can sail out into the wide-open sea?" chuckles. "When I get out into that deep water, sometimes what I find is great and sometimes it isn't. That's cool, because I love to explore. I don't want to hinder anybody else's performance; I want to be consistent in my role as a bassist in an ensemble. But when the opportunity presents itself, I like to try things. Sisters, and Buddy Miles. He's worked in the studio with many of these artists and has racked up credits on everything from jingles to jazz to country sessions. "It's weird," he says. "But I think I'm good at seeing a situation for what it is and bringing whatever I can to it. Most bassists who get hired for a lot of funk gigs don't turn up at many jazz gigs, but I've been blessed with the chance to work jazz to pop to TV to whatever. In fact, I used to get upset when people called me a funk bass player, because I didn't want to be categorized; I'd rather be thought of as a bass player who can play funk. I'm happiest as a jack of all trades." Being a happy jack means that Davis has become a master of adjustments, able to fine-tune his playing from strict time to push-ahead groove to behind-the-beat fatness. "For me, it's got everything to do with the drummer. I've played with some of the greats, and they all feel different. Some are sticklers for the groove, some are loose, and some are tight. I take pride in adjusting to them; I'm flexible, and I like to learn. I'm not set in my ways. If the drummer lays down a pocket, I'll find it." Not only does Davis take pride in being able to shape his abilities to his musical circumstances, he sees no point in passing judgment as he moves from genre to genre. "A lot of people say, 'Jazz is where it's at,' and they turn up their noses at everything else. But is's all music to me. There are people who love rock, so if I'm hired to play rock, I try to make them love it even more. I'll wear my jazz hat, my rock hat, my country hat - whatever's called for. I've got a closet full of hats, and I like to wear them all." Davis also has a closet full of basses. He's been a Ken Smith enthusiast for a number of years, and he owns a custom-built 5-string, eight custom 6's, and a pair of 7's, all equipped with Smith's pickups and fitted with Smith's taper-wound strings. Melvin favors a '70 Fender Jazz Bass. On the road, he runs his basses through a Bag End rig that includes an ELF-1 Extended Low Frequency Integrator and a pair of S18E-D loudspeaker systems. He sometimes uses a volume pedal, digital reverb, or T.C. Electronic chorus, but generally Melvin goes for pure bass presence. His sound is even more pristine in the studio, where he tends to run his basses directly in the board. The 7-string looks entirely at home in Davis's hands these days, but the instrument did have a rather unusual genesis. While on the road with guitarist Ritenour, Melvin was having trouble falling asleep in a hotel one night - and then a strange vision came to him: one with seven strings. "It just popped into my head. I grabbed some paper and started sketching it out, and hey - it started looking pretty good. I wrote 'Think about it' on the paper and faxed it to Ken." No stranger to unusual custom requests, Smith took up the challenge. Starting with the same dimensions as a 6-string, he worked out the logistics of the headstock, doubled the strength of the neck's graphite reinforcement rod, and made other adjustments. After a year of refinements, Smith delivered the instrument to Davis. "I enjoy playing it, and I enjoy expressing myself on it," Melvin says. "It's become a part of me." Lately, Davis has been using the 7 to get some writing done; he's hoping to develop an album project for Ritenour's label. He's discovering that his writing has as much range as his resume - he's come up with material that stretches from blues and R&B to hip-hop and fusion. "Well, I can find something satisfying in whatever I'm playing," he laughs. "I believe music is the ultimate communicator, so I don't worry about the style. My main objective is for the music to touch people. Communicating without saying a word - that's the best feeling. 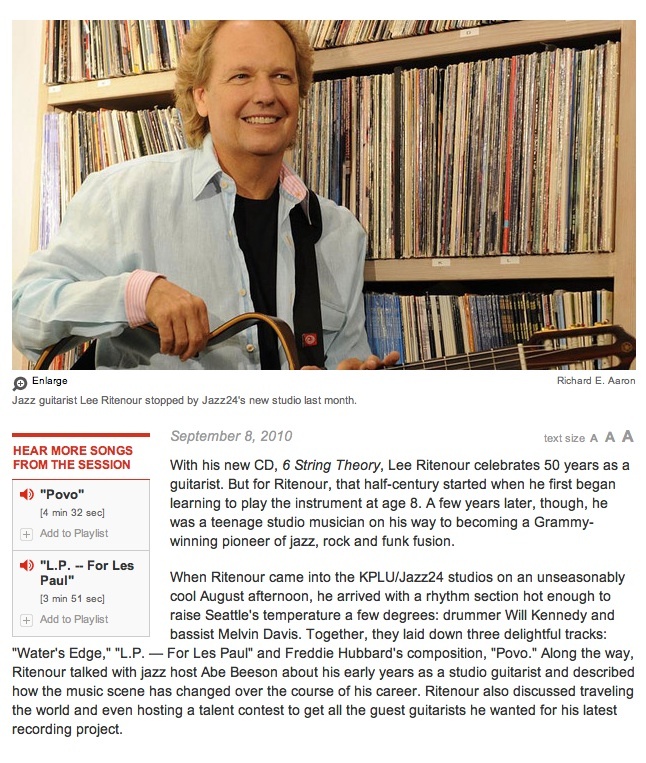 Guitarist Lee Ritenour has always carried the right credentials. Thursday, playing at the Ash Grove on the Santa Monica pier, he lived up to them. Streisand. But Ritenour, beginning with his breakthrough "Captain Fingers" release of 1977, has also been heavily criticized in the jazz community for putting his credentials aside to pursue fusion and instrumental pop. His reputation as purveyor of soft, beat-minded jazz has persisted in recent years despite the release of more ambitious albums, including 1992's Montgomery-inspired "Wes Bound." 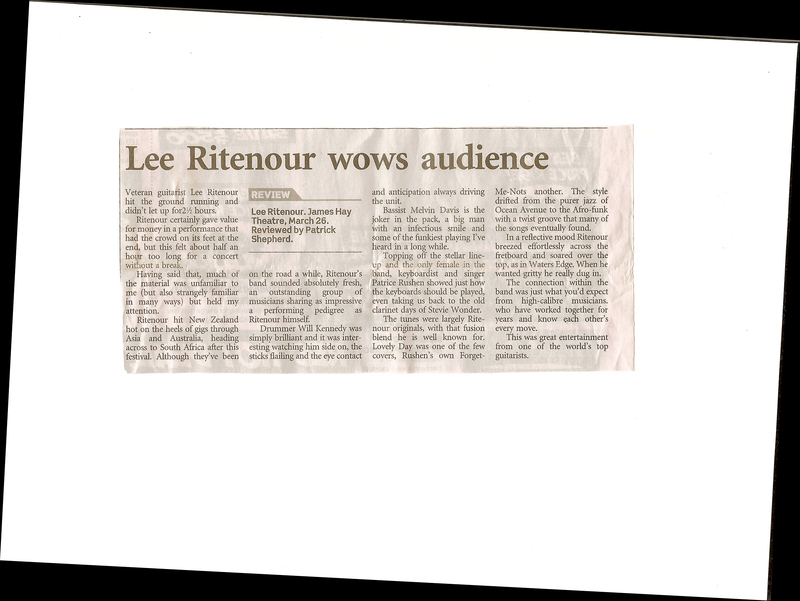 Ritenour's Thursday appearance, the first of three nights being recorded for a live album, demonstrated how wrong it is to dismiss him as another easy-listening guitarist. The two-hour program, spanning some 20 years of original material as well as classics from Nelson and Montgomery, presented a more refined side of Ritenour, one more focused on musical attractions rather than commercial appeal. Though a number of his original songs moved to accessible beats ("Night Rhythms," "San Juan Sunset"), they contained melodic and harmonic elements, as well as alert, inventive interplay from the sextet's members, that made them more than simple exercises. The tunes propelled by more involved rhythms ("Wes Bound," "Stolen Moments," a new, as-yet-untitled acoustic piece), were even more deeply layered with attractions. The bass-drums anchor of Melvin Davis and Sonny Emory proved sturdy as it varied from hard backbeat to cool swing rhythms. Davis proved particularly adaptable, walking agilely on electric bass, stoutly on upright, then pounding out thumb-driven funk. With saxophonist Bill Evans serving as improvisational foil and dual keyboardists Barnaby Finch on synthesizers and Alan Pasqua, soloing smartly on both acoustic piano and organ, Ritenour played with confidence and lyrical spice, emphasizing content over flash. Only at rare moments did he utilize clean-cut, lickety-split runs and those fell naturally into the flow of his play. The Ash Grove, better known as a home for blues, roots and world-beat music, served the music well. Its location above the breakers gives it a traditional West Coast feel in the beach-side tradition of the historic days of the Lighthouse and Concerts by the Sea. It boasts good sight lines, intimacy and clean, well-amplified sound. For the Ritenour show, a full house filled the small tables crowded in front of the bandstand and the loft built over the back of the room. Time and again throughout history, extraordinary individuals appear before the masses and lead by example in times of strife. Some of these go on to claim a place in history, enshrined by their legions with evocative, one-name handles. Charlemagne, for example. Or Alexander, Augustus, Melvin.....Melvin? Why not? Bassist Melvin Lee Davis is the musical director for both Chaka Khan and Lee Ritenour, and while he's not the type to lead armed troops into battle, that doesn't diminish the responsibilities of his task. He's the one who deals directly with the name artists. He's the one who realizes their vision by helping assemble the personnel for each band. And he's the one who takes responsibility for keeping the band in line and moving the performance forward. He's also the one laying down the groove, so when it comes time to lead, Davis relies on his Bag End D10BX-D 2x10 cabinet to back him up. A single 2x10? Again, why not? "Who I am as a person has everything to do with how I'm viewed (as the musical director) in these organizations," he says, "but how I sound and the equipment I use says something as well." Having played through just about every other rig known to humankind, Davis was introduced to Bag End's line a few years back when he was using all sorts of different components from Various manufacturers. "They (Bag End) told me about this ELF system back when I was using some other gear," he recalls, "and they brought one to me at a show in Chicago." That rig - consisting of an ELF-M integrator, an early 2x10, and two S18E subwoofers in stereo - stirred Davis' soul with its delicious low-end delivery yet still left him yearning for a certain something. "I used that system onstage and I liked the rumble, but that 2x10 was too shallow. I need lots of low end for club situations, but I wanted to know that I could get it from a single 2x10 if I had to." After speaking with the people at Bag End, Davis helped them design the D10BX-D, which gave him the ability to break down his setup for gigs at smaller clubs without sacrificing his sound. "There are lots of places where I can't bring in this whole setup," he says. "Soundmen would be frightened by it, like, "Whoa, this guy's got some subs'," he says mockingly, "and some of them would hate my big system because there was so much bottom coming off the stage. I've even done big arena shows where the house soundmen complain, but that sound is what I love about it. The sound is so huge, and I didn't want to give that up. "I need to know that I can get the punch and the low end from a single cabinet, and now I can," Davis adds. "This system works so well together; it's nice and clear, and I can take the 2x10 on its own into any club situation and really push some air." With the assistance of a Crest 500-watt stereo power amp, Davis keeps the ELF-M set to a relatively flat position, which lets his bass take advantage of the M's inherent processing capabilities to give him the sound he needs. "The really cool thing is that it's not colored," says Davis. "I don't use any EQ. It comes from the bass and whatever comes out of the speaker." "My system is complete from top to bottom," he says. "I checked it out while I was out on the road for eighteen months with Bryan Ferry, and I found what combinations worked best for me. The D10BX-D is definitely the best speaker system I've ever used. By far. It's a Rolls Royce; all the others are Cadillacs." Not one for delving into the mysteries of signal processing and speaker technology, Davis is somewhat in the dark as to the mechanics of how his system works, but this doesn't temper his enthusiasm for its ability to give him the right sound in every situation. "All the ELF cabinets are sealed, which is really amazing to me because the bottom you get out of the D10BX-D is incredible," he notes. "I don't know how they do it, but they did it. I don't know much about the technical end of things, and that's probably sad, but it's always been about the ear for me. If it feels good and sounds great, that's it. This system is it, and I'm not about coddling anyone; it's about being honest." So with a firmly entrenched confidence that his equipment won't fail him, Davis is comfortable serving as musical director for Khan and Ritenour, with responsibilities to act as conduit to their respective bands and allow each of his musicians to express his or her ideas. "Musical directors are often used as mouthpieces for higher-ups, if you will. It's my job to convey (Khan's and Ritenour's) ideas, and it's my expectation that the musicians execute them," he says. By bringing the best players together for each situation and allowing them to express themselves without being a dictator, Davis ultimately functions as a catalyst of talent, for leaders and backup band alike. "I'm a big believer in not being the person who hires people so that I can tell them what to do," he says. "All that's required is that you have a love of the music. The bottom line is that it's all about the music, and all you really need to do is have a passionate love for it and come ready to play it. If I have to sit and tell you what to do every day, you shouldn't be there. I can't play your instrument for you." Saturday's opening installment of the Newport Beach Jazz Festival served to prove just how blurred the designation of "smooth jazz" has become. This sixth annual celebration of the music variously dubbed adult-contemporary or smooth jazz, held on the grounds of the Hyatt Newporter hotel, featured a diverse lineup that included a slick trumpeter, a churchgoing vocalist, a flamenco-styled guitarist and a raunchy, R&B saxophonist. Throw in a guitarist who quoted Jimi Hendrix, an electric keyboardist with a sunny attitude and a singer of round-midnight standards, and you begin to realize that smooth jazz can be anything and everything, a term as nebulous as most musical categories. 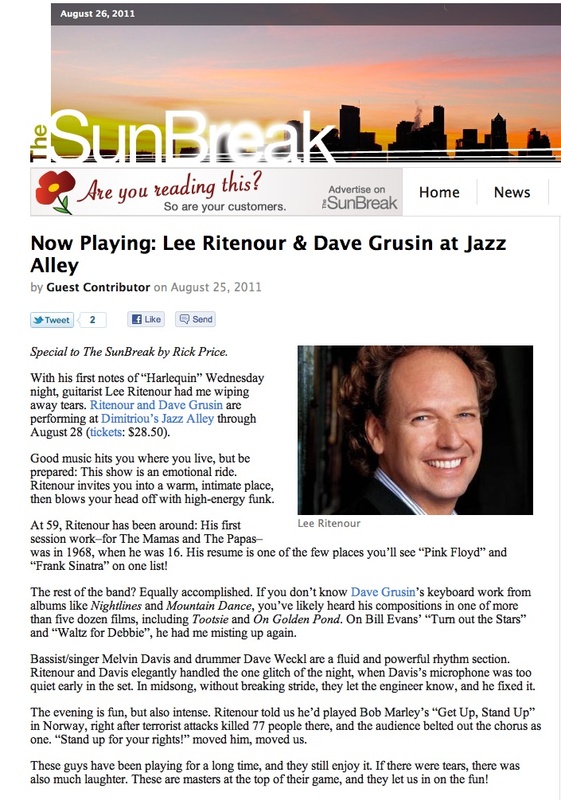 Above all, smooth jazz is party music, geared for a good time. And Saturday's headliners--guitarist Marc Antoine, trumpeter Rick Braun, vocalist Oleta Adams, guitarist Lee Ritenour and saxophonist Dave Koz--succeeded especially well in this respect. Between acts, there was music on a second stage high atop a wind-swept hill from keyboardist and Newport Beach resident Scott Wilkie's band or smoky vocalist Jacqui Naylor's mainstream combo. Nearby, vendors of food, drink, crafts and other services added to the carnival atmosphere, and there was plenty of opportunity for mingling with fellow fans. Today's smooth jazz has its roots in the 1960s jazz-funk experiments of trumpeter Lee Morgan, pianist Horace Silver and especially saxophonist Cannonball Adderley. The 1999 edition of the Newport fest was at its best when it recalled the spirit of those days. Braun and Koz each led bands that embraced the same rhythm-and-blues influences that Adderley and others once mined. Yet Braun, even in his best moments, played second-rate Miles Davis, and his band lacked the rhythmic sharpness that marked Miles' crossover ensembles. Koz is an exciting visual player but had little new to say, though his band was a degree tighter than the trumpeter's. These quibbles matter little under the bright sunshine in a garden setting, with wine flowing freely and much of the audience on its feet grooving with the band. Braun and Koz both ignited the crowd with steady beats and emotive, if somewhat pretentious, play. The tightest and ultimately most satisfying of the day's performances came from guitarist Ritenour and a band that included saxophonist Eric Marienthal and electric bassist Melvin Davis. Combing through 20 years of material while throwing in allusions to Hendrix's "Purple Haze" and Davis' "Tutu," Ritenour and company managed to keep the party going full steam while providing some serious musical moments. Earlier in the day, singer and pianist Oleta Adams provided soul-stirring, Christian contemporary numbers with an electric band that made the link between flesh and spirit. She gave the day its most reflective moments with her version of Duke Ellington's "Come Sunday." On the hilltop stage, keyboardist Wilkie's band played two sets of strongly melodic, well-executed numbers that held smart solos from Wilkie, guitarist Matthew Von Doran and bassist NathanBrown. The day's smoothest performance came from lounge vocalist Naylor, who, swept by a steady breeze that blew sheet music off the stage, sang two short mainstream sets haunted by the ghost of Billie Holiday with an acoustic combo featuring saxophonist Bob Johnson. "Steve Lukather & Simon Phillips : Burning sound with the storm of odd times"
Steve Lukather made a special unit w/ a band mate Simon Phillips, and they played at all the Blue Notes in Japan. so most of us might expected they play straight-ahead rock and roll, But they gave us another happy surprise! Their shows were high-tech & progressive fusion w/ no 8 beats tune! It was about 15 min. before the show, the smell of incense came out from somewhere -- it looked like comes from the stage --- and then I saw really big drum sets on the stage. It's kind of usual setting at a rock concert, but it was at a jazz club. As far as I know, that was the 1st time for the Blue Note to having a drum set w/ such a big china gong. Anyway, the drummer of the band is Simon Phillips, there's no wonder even if there're more toms and gongs on the stage. He's been one of the top rock drummer who played w/ Jeff Beck, Mich Jagger and many big artists, and joined to TOTO after legendary drummer Jeff Porcaro. the frontman of the band; Steve Lukather -- You guys don't need any explanation from me about such a famous guitarist. He's started his career as a top session guitarist, then he formed the band TOTO and keeping solid&huge popularity for years. 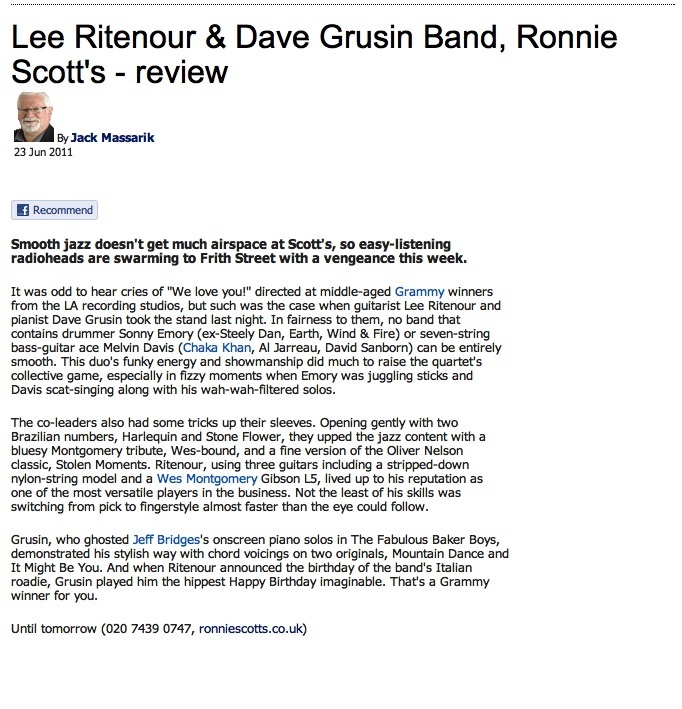 Needless to say, he also has played w/ Edgar Winter or Larry Carlton at the Blue Notes. 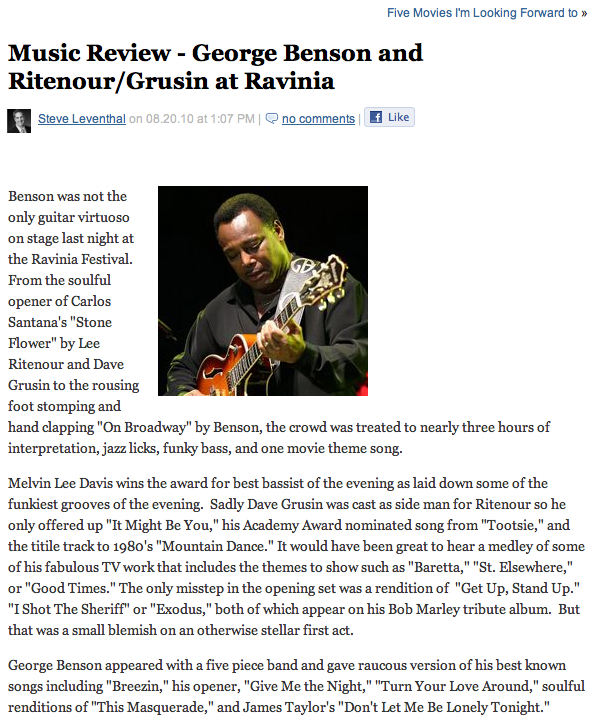 Melvin Davis is known as a very talented bass player who has played w/ Lee Ritenour, Chaka Khan and many artists. Keyboard player; Jeff Babko has played w/ artists like Julio Igresias, and then joined to Simon Phillips band. He's known as a new star player now. Actually I expected they would play straight ahead rock and roll because of their career. BUT! They made me surprise by very hard, progressive&high-tech fusion! The show was just like attacked by "the storm" of odd time tunes. As soon as Simon hit china gong twice, Steve started to playing 9/8 beats arpeggio. Wow, it couldn't be....! Is this song the title track of "Birds Of Fire"!? I've never thought Steve Lukather plays McLaughlin tune, so I leaned forward to listen to the sound unconsciously! Steve played awesome solo even on this 9/8 beats( ! ) tune and I saw many audiences were amazed at it. Simon played very powerfuly, and Melvin kept the groove tightly. oh the guys gave me thrills of joy on this song. Even after this song, I was thinking they play rock music and the 1st tune was kind of a surprise for fans, but they played another tune from "Birds Of Fire" as 3rd songs for the show, I was realized it was just what I'm rushly assuming. They featured electric piano sound of Jeff Babko's mainly on "Miles Beyond", his sensibility of harmony works is wonderful. also Melvin played a solo on this tune -- i was really impressed by his technical and inteligent sound on this solo. "Took a break" w/ straight 4 beats on 4th song "Crosswind", heavy groove of drums and bass was very cool on this tune. Steve played wildly, he jumped up and played on the table in the 1st row and made audiences excited. I really enjoyed Steve's coolness on "Song For Jeff" from his 2nd album "Candyman". Accordings to the title (this writer doesn't know this song is dedicated to Jeff Porcaro. ), He played w/ feed-backing very clevery and it reminds me of Jeff Beck. Steve played this song perfectly and made his guitar sound as if the guitar is singing. Simon Phillips played awesomely on another tune from "Candyman", at first came up w/ powerful sound w/ twin bass drums in 17/8 beats, but it turned into 4 beats once piano solo - guitar solo comes, and it was back to 17/8 beats and strong drum solo came up!My mouth was widely opened w/ surprise and I couldn't close it. 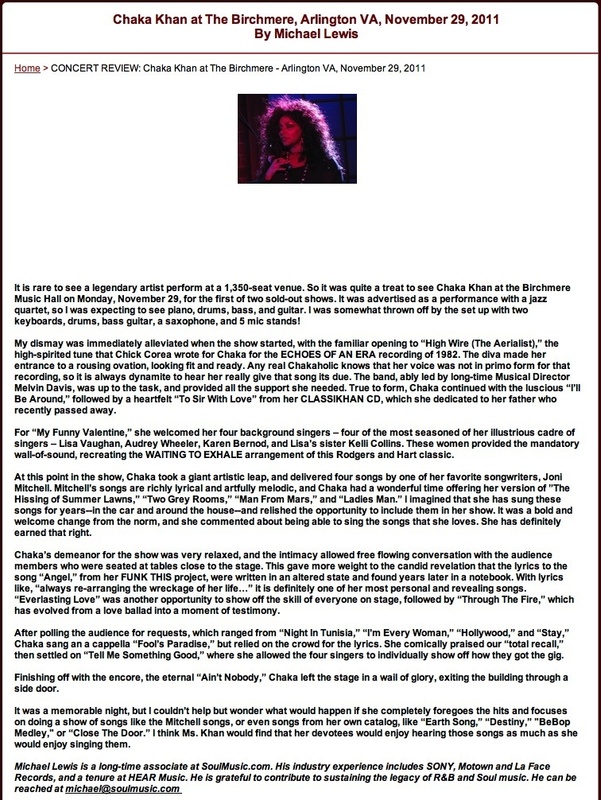 They closed the show w/ one more tune from "Birds Of Fire" at that night. Wow they played such awesome sound throughout the show. Steve Lukather & Simon Phillips -- I expected their great sound before the show of course, But those guys showed me ultra cool & better show than I expected!